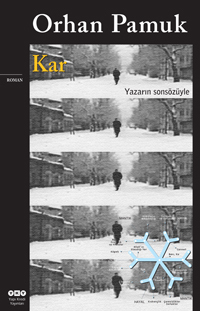 On the fourth day after his return to Turkey, Ka, a Turkish poet who has been an exile in Germany since twelve years, finds himself in the city of Kars for an interview. Walking under the slow and ceaseless snow, street by street, store by store, he tries to get to know this melancholic and beautiful city and its people. In Kars there are teahouses full of unemployed people, a snowbound traveling theatrical company, girls who protest and commit suicide for the headscarf banning, various political groups, gossips, rumors, Karpalas Hotel and its owner Turgut Bey, his daughters İpek and Kadife and a promise of love and happiness for Ka.